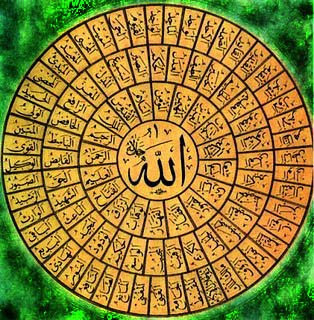 A well established Islamic tradition enumerates 99 names of Allah (Al-Asma al-Husna), also known as The 99 Most Beautiful Names of God. Each of those names representing certain attributes or descriptions of God; in which God is seen as being the source and maximum extent of each name's meaning. 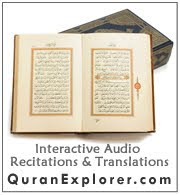 For example, the names Ar-Rahman and Ar-Raheem which are the most frequently mentioned in the Qur'an, both meaning the "Most Merciful", but with different emphasis of meaning, either of which are also often translated as the "Most Compassionate" or the "Most Beneficent". Allah, He who has the Godhood which is the power to create the entities. The Compassionate, The Beneficient, The One who has plenty of mercy for the believers and the blasphemers in this world and especially for the believers in the hereafter. The Merciful, The One who has plenty of mercy for the believers. The King, The Sovereign Lord, The One with the complete Dominion, the One Whose Dominion is clear from imperfection. The Holy, The One who is pure from any imperfection and clear from children and adversaries. The Source of Peace, The One who is free from every imperfection. The Protector, The One who witnesses the saying and deeds of His creatures. The Mighty, The Strong, The Defeater who is not defeated. The Compeller, The One that nothing happens in His Dominion except that which He willed. The Majestic, The One who is clear from the attributes of the creatures and from resembling them. The Creator, The One who brings everything from non-existence to existence. The Evolver, The Maker, The Creator who has the Power to turn the entities. The Fashioner, The One who forms His creatures in different pictures. The Great Forgiver, The Forgiver, The One who forgives the sins of His slaves time and time again. The Subduer, The Dominant, The One who has the perfect Power and is not unable over anything. The Bestower, The One who is Generous in giving plenty without any return. He is everything that benefits whether Halal or Haram. The Opener, The Reliever, The Judge, The One who opens for His slaves the closed worldy and religious matters. The All-knowing, The Knowledgeable; The One nothing is absent from His knowledge. The Constricter, The Retainer, The Withholder, The One who constricts the sustenance by His wisdomand expands and widens it with His Generosity and Mercy. The Expander, The Englarger, The One who constricts the sustenance by His wisdomand expands and widens it with His Generosity and Mercy. The Honorer, He gives esteem to whoever He willed, hence there is no one to degrade Him; And He degrades whoever He willed, hence there is no one to give Him esteem. The Dishonorer, The Humiliator, He gives esteem to whoever He willed, hence there is no one to degrade Him; And He degrades whoever He willed, hence there is no one to give Him esteem. The All-Hearing, The Hearer, The One who Hears all things that are heard by His Eternal Hearing without an ear, instrument or organ. The All-Seeing, The One who Sees all things that are seen by His Eternal Seeing without a pupil or any other instrument. The Aware, The One who knows the truth of things. The Forebearing, The Clement, The One who delays the punishment for those who deserve it and then He might forgive them. The Great One, The Mighty, The One deserving the attributes of Exaltment, Glory, Extolement,and Purity from all imperfection. The Most High, The Sublime, The One who is clear from the attributes of the creatures. The Maintainer, The Guardian, The Feeder, The Sustainer, The One who has the Power. The Generous One, The Bountiful, The Gracious, The One who is attributed with greatness of Power and Glory of status. The Watcher, The Watchful, The One that nothing is absent from Him. Hence it's meaning is related to the attribute of Knowledge. The Loving, The One who loves His believing slaves and His believing slaves love Him. His love to His slaves is His Will to be merciful to them and praise them: Hence it's meaning is related to the attributes of the Will and Kalam (His attribute with which He orders and forbids and spoke to Muhammad and Musa -peace be upon them- . It is not a sound nor a language nor a letter.). The Most Glorious One, The Glorious, The One who is with perfect Power, High Status, Compassion, Generosity and Kindness. The Reserrector, The Raiser (from death), The One who resurrects His slaves after death for reward and/or punishment. The Most Strong, The Strong, The One with the complete Power. The Firm One, The One with extreme Power which is un-interrupted and He does not get tired. The Originator, The One who started the human being. That is, He created him. The Reproducer, The One who brings back the creatures after death. The Self-Subsisting, The One who remains and does not end. The Acceptor of Repentance, The Relenting, The One who grants repentance to whoever He willed among His creatures and accepts his repentance. The Pardoner, The Forgiver, The One with wide forgiveness. The Eternal Owner of Sovereignty, The One who controls the Dominion and gives dominion to whoever He willed. The Self-Sufficient, The One who does not need the creation. The Distresser, The One who makes harm reach to whoever He willed and benefit to whoever He willed. The Guide, The One whom with His Guidance His belivers were guided, and with His Guidance the living beings have been guided to what is beneficial for them and protected from what is harmful to them. The Supreme Inheritor, The Heir, The One whose Existence remains.